Imagine waking to a 360-degree view spanning snow-covered trees, panoramas of glistening mountains, and imposing vistas stretching for miles. That’s a taste of what you could experience from one of Oregon’s lookouts. Built as watch towers for forest fires, the lookouts rest on stilts above the ground or perch atop rocky outcroppings, commanding stunning views of the forest below and some of the best stargazing you could imagine. But you don’t have to imagine it — you can rent one and experience those views first-hand. Situated miles from civilization, without water, and often only accessible via snowshoe, skiing, or snowmobiling, these destinations aren’t for the faint of heart. 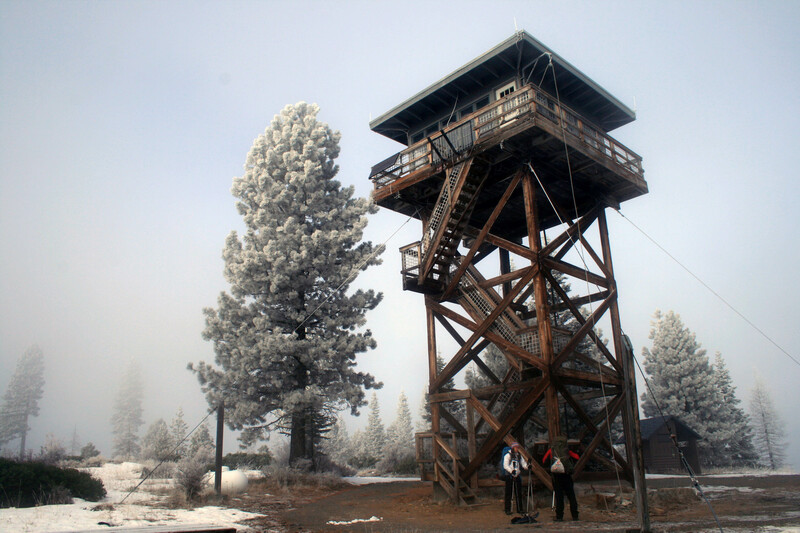 But if you’re up for it, these Oregon fire lookouts are available during the winter months for some frozen, awe-inspiring views. Sitting on a rocky, flat-topped butte at an elevation of 5,636 feet, Flag Point Lookout rises another 60 feet above the ground. Surrounded by stands of Hemlock, Fir, and Western Larch, its commanding height offers a broad sweep of the Cascade Range and the Badger Creek Wilderness. Mount Hood dominates the view from the front door, with Mount St. Helens, Rainer, Adams, Jefferson, and the 3 Sisters adding extra panache to the already stunning panorama. Originally constructed as 6-foot square cabin on a 40-foot pole tower, the lookout has gone through a few structural changes in the 92 years the first pole was erected. The current lookout, built in 1973, rests upon 4 cement footings and holds aloft the 14x14 foot cabin with a maze of cross-braced, pressure-treated timber. The entire structure is held in place by stay cables. A wooden catwalk rings the entire cabin, but if you prefer your mountain views in warmth, the four walls of windows offer ample opportunity to feast your eyes on the wonders of the scenery. The small cabin is furnished with a mattress, a wood stove for heat, gas cook stove, table and chairs, and a solar lighting system. There is no running water on site and the outhouse sits below. There is plenty of firewood in the shed, but you may need to chop your own kindling. This is a pack it in, pack it out facility. While unquestionably worth the journey, getting to Flag Point Tower in the dead of winter is not an easy undertaking. Forest Service Road 44 and 4430 is closed to vehicles wider than 48 inches from December 15th to March 15th, so you’ll have to park at Billy Bob Sno-Park (get a NW Forest Pass — $5/day or $30/year), and ski, snow shoe, or snowmobile the 11 miles to the lookout. Depending on conditions, the journey is listed as moderate to difficult, and could take as many as 8 hours, so don’t undertake it without decent backcountry skills. Another jewel of the Mount Hood National Forest, Clear Lake Cabin’s 40-foot vertical provides the perfect vantage to survey the snow-gilded caps of Hood, and Jefferson, snow-covered firs, and pristine alpine lakes. The rustic 14x14 room is perched on Clear Lake Butte, a 4,454-foot gently sloped hillside on the south side of the mountain. Similar in design to Flag Point Lookout, the current structure was built in 1962 with the same cross-braced timber, cable stays, and square cabin circled by a wooden catwalk. The room is furnished with a small bed, a wood stove for heating, propane cook stove, and a table and chairs. Solar-powered light is available, but you may want to bring your own light source as well. A vault toilet is located below (bring your own toilet paper), along with a shed stocked with firewood. The trip to the tower is short — approximately 3.2 miles from the parking area. But it’s steep, rising 900 feet in elevation. Depending on conditions, it’s typically listed as a moderate trail with a completion time of 3 ½ to 4 hours. If you’re lucky, you may find a groomed trail, as the Mt. Hood Snowmobile Club voluntarily maintains hundreds of trails in the area. Tucked deep in the central Cascade Range, the remote Warner Ridge Lookout sits at 5,300 feet and offers views of Diamond Peak, the rim of Crater Lake, Mount Jefferson, Washington, Three Fingered Jack, and miles of snow-topped forest. A departure from the R6 flat-roof cabins in Mount Hood, Warner Ridge features a cupola style. The main cabin is the typical 14x14 room equipped with propane heat, bed, table, chairs, propane cook stove, and emergency radio. But for a little extra viewing pleasure, a ladder leads up to a small observation cupola where the fire table and equipment is housed during the summer. The journey to the lookout depends entirely on weather conditions. You might be able to drive nearly the entire length of the access road, or you may need to park your car along the shoulder of Forest Road 2129 and hoof it 10 miles with 2,000 feet of climb. The trail is listed as difficult and could take a full day to access, so start early. The smallest of the bunch, both in size and elevation, Pickett Butte still packs a punch with its panoramic views of rolling hills and ponderosa horizon frosted in white. Crater Lake is a mere 35 miles away, and although not visible from the lookout, it’s a tempting distance for a visit after your stay wraps up. Situated at 3,290 feet on Pickett Butte and standing 40 feet high, the 12x12 cabin offers glimpses of Devil’s Knob, Butler Butte, and Colin Butte, as well as brilliant sunsets and sunrises. Due to its lower elevation, you may not have to deal with snow, but don’t bank on it. Check weather conditions before you head out. The room comes equipped with a bed, propane heater, cook stove and oven, and lanterns. Per standard lookout amenities, there is no plumbing — so, bring your own water and make use of the outhouse when nature calls (don’t forget to bring TP). The stairs leading up to the cabin are very steep and narrow. For those not especially keen on climbing 3 stories for jaw-dropping views, Hager Mountain may be the place for you. Perched at 7,195 feet atop a rocky outcropping, all that’s required to enter this cabin is 3 short steps . . . and about 4 miles of snowshoeing or skiing a 2,000 feet elevation gain. But once you’re inside, the butte drops away below the deck, and you’re treated to the shimmering lights of Silver Lake, views of Mt. Hood and Shasta, and a brilliant display of the constellations. The 14x14 cabin sleeps 4, with 1 bed and 1 bunk, a wood stove, propane cook stove, and a few cooking utensils. The outhouse sits slightly downhill from the lookout, along with a shed fully stocked with firewood, and a picnic table. The weather conditions at Hager Mountain can change abruptly, so come prepared to survive a night outside in a winter storm. Although 4 miles might not seem much, with the elevation gain and snow pile-up, it can be a strenuous journey that requires relatively decent physical fitness. With year-round availability, close proximity to Portland, and relatively easy access, Five Mile Butte Lookout may prove the most difficult lookout to rent. Like its other Mt. Hood brothers, Five Mile features the R-6 Flat Top cabin towering 40 feet above the ground on cross-braced timber. And like the other lookouts, the 360-degree views of the Cascades, with Mt. Hood filling the windows and Tygh Valley spread out far below, are stunning. The cabin comes equipped with a single bed, wood stove, propane cook stove and oven, a table, chair, and various cooking utensils. A vault toilet and fully-stocked wood shed sit below. Book 180 days out, dates fill up fast. However, if you’re hoping to go now, check back on the site frequently. Cancellations aren’t uncommon, and you may get lucky, especially if you’re willing to nab a more remote lookout on a weekday. Call the ranger station 4 days before your reservation date to get the code to unlock the lookout. Read the log book for stories and helpful hints, and add your own clever musings or sketches. Remember matches or a lighter. The ignitor on the stovetop may not work. Basic backcountry knowledge, but always worth a reminder. Have you been to any of these lookouts and have some tips or stories to pass on? Let us know in the comments below!